Features: Mar resistance and flow control. Effective at low concentrations. Description: A mar, slip, and flow control agent for water and water reducible systems. It also reduces blocking and face-to-face marring and, unlike many competitive materials, it is HAPs (Hazardous Air Pollutants) free. Raybo 68 HydroSlip improves substrate wetting and allows the coating of less than ideal steel. 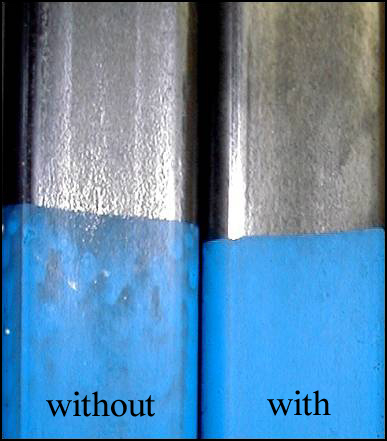 Coating over dirt and oil reduces adhesion, but when the coating contains raybo 68 HydroSlip, a continuous film is produced (as can be seen here) with acceptable adhesion.